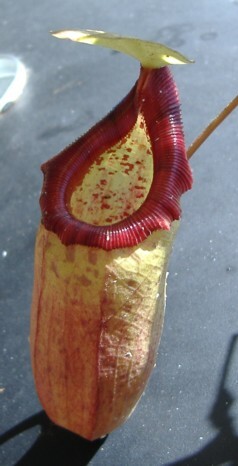 Nepenthes ventricosa X bongso is a hybrid between two highlanders. I purchased this plant from the Leilani Hapuu Nursery in Hawaii. I don't know if this plant was an original Exotica Plants clone or not. The price was very reasonable so I decided to get it. It seems to be an easy going plant that i grow in full sun. So far it has adapted to my outdoor conditions fine. All of the cuttings I have purchased from Leilani Nursery do real well for me. I wouldn't consider this a highly sought after hybrid but N. ventricosa hybrids are generally hardy and fairly quick growing that demand little attention. Many of these type of hybrids make good experimental plants outdoor or indoors because of their wide ranging tolerances.